It hasn’t been quite two weeks since Rachel Cliff set the new Canadian Women’s Marathon record but I can’t stop thinking about it. It’s so exciting. Full disclosure, I am a running junkie and I love arm-chair cheering for the world’s best runners. And I have a new running HERo. And I love what she has to say about racing in a women’s only event. The Nagoya Women’s Marathon was originated as the Nagoya International Women’s Marathon, an elite race known as a qualifying trial for the Olympics and the World Championships. To respond to the expectation of marathon fans across the country, the race was reformed into a mass marathon event with participants of 15,000 women in 2012. While the race still serves as a world-leading competition among elite athletes, its time limit is set to be 7 hours long, so that even beginners can consider it! Their completion rate in 2018 was 96.5%. As the founder of a women’s only race series, I do believe women’s only events are super special. If you have ever been to a Sole Sisters Women’s Race then you have seen the collective power of having women lift each other up. We spend a lot of time talking about how inviting, accessible and encouraging Sole Sisters is. But you know what, women’s only events are also an opportunity for women to be very fast. I personally, believe quite strongly in the concept of “Be the Inspiration” and all of its iterations. I want women to help each other and sometimes that help is in bringing out their competitive fire. While we do not time our Saturday night race, we do time Sunday’s races and the courses are certified by Athletics Canada. Sole Sisters offers a 4-hour time limit which is considered very generous by Half Marathon standards because speed is relative! Bring your best, whatever that is. And if you are finding holding a pace difficult, know that we will have TWICE the number of paceHERs that you would expect. THANK YOU True North Pacing. Now back to my arm-chair cheering, I admit I really only obsess over marathoners and in particular women marathoners. I have done 60 marathons myself and have a coveted sub-3 hour marathon in there. Most of my knowledge is about American runHERs but that is because they get more press. My focus used to be on American Distance Running because that is where I was from and for a long time the most exciting runHERs were American (or so it seemed living in the US). Doesn’t everyone know the names Kara, Shalane, Deena, Molly and Desiree? And when I moved to Canada, I learned there isn’t an Olympic Marathon Trials like the one in the US. This totally bummed me out for the sub-elite Canadians runners that are sometimes referred to as “local elites” or “locally competitive”. For American runners, the Olympic Trials are your chance to shoot for the stars. To get to the Olympic Trials is huge. There are usually just over 100 women who will never make it to the actual Olympics but they secure the qualifying time and race against their country’s best. They are the sub-elites, local elites, local competitive runners that don’t have a chance to win on the world stage but they are very good for non-professionals. The top three women at the Trials go on to represent their country at the Olympics. For the women that just barely qualify, it’s like their super bowl and just being there is an honor. I have been to the last four American Marathon Olympic Trials and am currently planning to be in Atlanta next February to see the next one. There are many runners like myself that look forward to watching the Trials because you see real grit and gratitude. It’s that kind of support and excitement about the Olympics that encourages the sport to grow and inspire the next generation. In my humble opinion. Speaking of the Olympics, in 2012, Lanni Marchant finished the Rotterdam Marathon with a time of 2:31:50. While Marchant’s time met the IAAF qualifying standard of 2:37, it did not meet the Canadian Olympic “A” standard of 2:29:55, so she was not eligible to represent Canada at the 2012 London Olympics. A subsequent appeal was denied by Athletics Canada. In the four-year race cycle leading up to the 2016 Rio Olympics it seemed that Lanni Marchant and Krista Duchene were everywhere. Lanni and Krista were chasing Olympic dreams and national marathon records. They were fast and they were going to the Olympics. To build heroes (or to inspire others) we have to hear about these runners. Most Canadians know that it was Lanni Marchant who finally after 28 years set the “new” Canadian Marathon Record of 2:28:00 and she did it at the Toronto Marathon in 2013. We also know that Krista DuChene ran 2:28:32 at that record breaking event. Plus, she broke her right femur at the finish of the Montreal half-marathon in 2014 (still the worst thing I’ve seen at a finish line) and she was on the podium at the Boston Marathon in 2018 and first master. Lanni and Krista, represented Canada in the Marathon at the 2016 Rio Olympics, the first Canadian women to represent Canada in 20 years. So can you see why I am excited? Rachel Cliff has the Canadian Half Marathon record [1:10:08 set in March 2018] and the Canadian marathon record [2:26:56 set in March 2019]. And she isn’t even sure which running event to pursue in her 2020 Olympic bid! 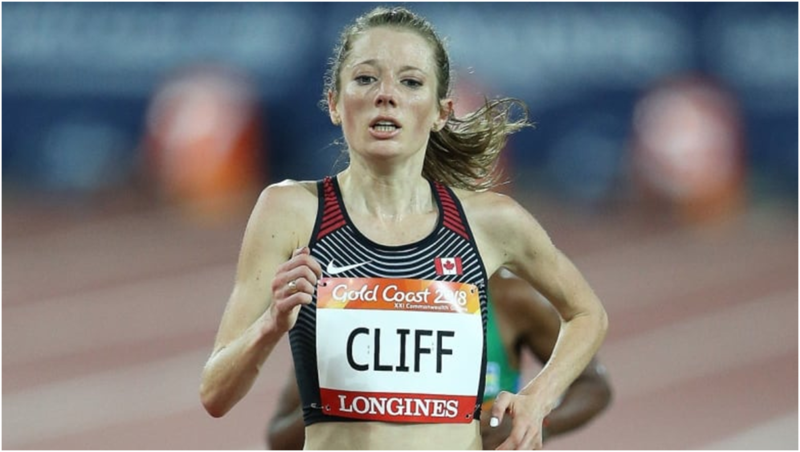 Cliff is also a threat on the track in the 10,000 metres after finishing ninth in her Commonwealth Games debut last April and winning the women’s Canadian championship two months later. I am rooting for her to do the marathon of course and she has the qualifying time to go to Tokyo! Cliff might decide to pursue both events since there is a precedent (Lanni Marchant competed in the 10,000 and marathon at the Rio Olympics). I can’t wait to watch her season. And if you like watching shorter, faster races then watch out for Gabriela Stafford and Jenna Westway as both runners have already broken Canadian Records this year! Canadian runHERS are on fire and I am so excited! If you are planning your race season you won’t find a more affordable option than Sole Sisters Women’s Race Weekend!